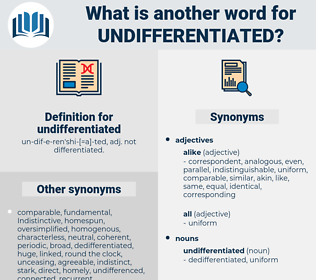 What is another word for undifferentiated? 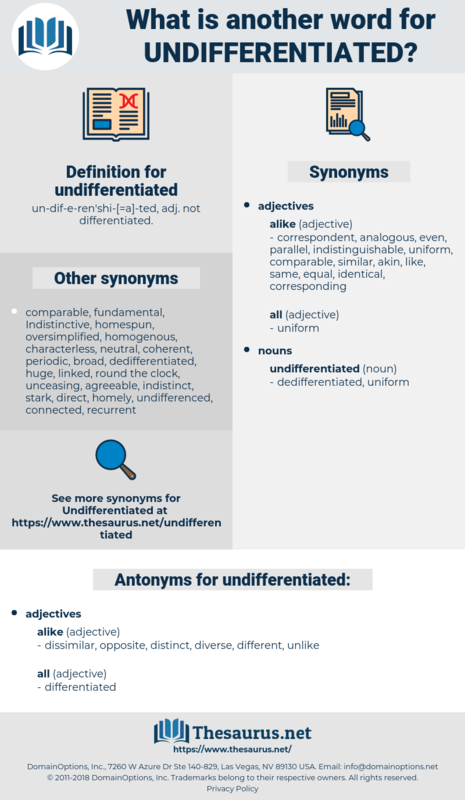 un-dif-e-ren'shi-[= a]- ted, adj. not differentiated. dissimilar, opposite, distinct, diverse, different, unlike. disconnected, unrelated, disparate, unalike, alien, disagreeing. changing, divergent, unfriendly, unequal, variable, away, inconsistent, far. It is probable that to its instability its numerical abundance is to be traced - for this, necessitating the continual supply of all the parts already formed, renders large, undifferentiated growth, incompatible with the limited supplies of the environment. On each repetition of the fits the neighbouring organs, reverting to a more primary undifferentiated condition, will discharge duties for which they were not engaged, in a manner for which no one would have given them credit, and the disturbance will be less and less each time, till by and by, at the sound of the crockery smashing below, Lady Croesus will just look up to papa and say: " My dear, I am afraid Sarah has got another fit."